Orthodoxy, Autocracy, and Nationality (Russian: Правосла́вие, самодержа́вие, наро́дность, Pravoslávie, samoderzhávie, naródnost'), also known as Official Nationality, was the dominant ideological doctrine of Russian emperor Nicholas I. It was "the Russian version of a general European ideology of restoration and reaction" that followed the Napoleonic Wars. "The Triad" of Official Nationality was originally proposed by Minister of Education Sergey Uvarov in his April 2, 1833 circular letter to subordinate educators. It was soon embraced by Nicholas and his establishment and gained wide public recognition, vocally supported by intellectuals like Mikhail Pogodin, Fyodor Tyutchev and Nikolai Gogol. Critics of the policy saw this principle as a call for Russification. Yet the very fact of its existence, being Russia's first statewide political ideology since the 16th century, indicated the nation's brewing transition to modernity. Nicholas I emerged as the emperor in the wake of Decembrist revolt; subsequent investigation proved that disloyalty was deeply rooted within the noble estate – the sole foundation of the House of Romanov. His father and grandfather were killed by their own guards and statesmen in palace coups. Keen to eradicate the rebels and ensure his own physical security, Nicholas carefully studied proceedings of the Decembrists investigation and was aware of defects in his predecessor's government that fueled the mutiny. "In one sense, the reign of Nicholas I was a protracted epilogue to the Decembrist rising." Nicholas, acting in line with his absolutist predecessors of the Age of Enlightenment, developed a state education system and completed codification of the law. He installed a highly regulated but ultimately inefficient government system of "anxious centralization", himself being the chief arbiter between rivalling statesmen. Unfortunately the system created by Nicolas I was unsound and ineffective, since the Emperor did not have any physical possibility to oversee personally all the business and to personally look through all papers to be signed. The Emperor found himself a prisoner of his own system, so he could only rely on his high officials in most of his day-to-day activity. Higher officials relied on officials of lower rank. In most cases government officials, even ministers, did things on their own and paid little attention to general instructions given by the Emperor in one case or another. The autocracy was exploited by government officials (chinovniki) for their own benefit. The autocracy in fact turned out to be a cover to hide the acts made by officials at all levels. Back in those days, it was chinovniki who had real power, but not the Emperor, who was nothing more but a promulgator of laws. Nevertheless, if a certain law was not lucrative or was disadvantageous for government officials, it was not a problem to make legal obstacles to enforce such law. Sometimes a law was simply abolished without the Emperor knowing about it, as it was usually the case with the Emperor’s acts regulating commercial activity of Saint Petersburg negotiants (kuptsy). In any case the Emperor always got a report that everything went well and all his instructions had been implemented. But he also attributed the nobles' disloyalty to a Europe-wide conspiracy aimed at destroying ruling monarchies, religion and morale. Russia, according to his point of view, succeeded in Napoleonic Wars while more advanced regimes failed, and saved Europe from plunging into decay and atheism. Sergey Uvarov in the 1830s. Engraving by Nikolai Utkin. It is our common obligation to ensure that the education of the people be conducted, according to Supreme intention of our August Monarch, in the joint spirit of Orthodoxy, Autocracy and Nationality. I am convinced that every professor and teacher, being permeated by one and the same feeling of devotion to the throne and fatherland, will use all his resources to become a worthy tool for the government and to earn its complete confidence. 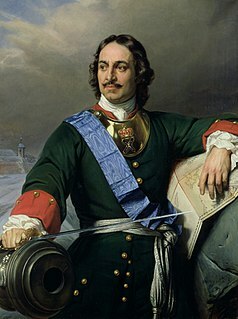 Tsar Nicholas I had remembered the Decembrist revolt for all his life. He always suspected secret societies and uprisings to be plotted around him. Such personal feelings of the Tsar had great influence on the development of Russia. In order to meet the demands of the new state of affairs under Nicholas I, the Minister of Public Education S. Uvarov proposed to give new original shape to the national educational system. He said that Russia needs such educational system which could produce skilled, professional, well prepared executors of the Emperor’s wishes. Such educational system should not only provide knowledge to people, but also made them unconditionally loyal to the Emperor. Briefly speaking, Uvarov tried to deprive education of its most important integral part – analytical and critical approach to environment (specifically to political environment). According to Uvarov’s theory, the Russian folk (narod) is very religious and devoted to the Emperor, the Orthodox religion and autocracy are unconditional bases of the existence of Russia. Narodnost (nationality) is deemed to be the necessity to follow independent national traditions and to fight foreign influence. The theory stated that it was necessary to reject western ideas – freedom of thinking, freedom of personality, individualism, rationalism which were considered by Orthodox hierarchs as dangerous and rebel thinking. The chief of Russian political police (the III Department of His Majesty's Personal Chancellery) A. Benckendorff wrote that “the past of Russia was wonderful, the present is splendid and the future is above all dreams”. These three concepts were considered as "pillar-walls" of the Russian Empire. Uvarov's triad was the first explicit statement of government ideology in Russian history since the 16th century. He repeated the triad and elaborated on the topic throughout the 16 years of his ministry and was eventually awarded the title of a Count. "Orthodoxy, Autocracy and Nationality" became the Uvarov family motto, decreed by Nicholas. Yet he also did much as a true educator, raising educational standards, establishing new colleges, increasing the number of scholarships for overseas training. Under Uvarov, the "Russian educational system, with all its fundamental flaws, came to emphasize academic thoroughness and high standards", although it also became more exclusive at all levels. It means that only less than 1% of Russian population (only noble ones, many of them of foreign descent) had the possibility to get the education, it was almost impossible for Russian non-nobles to get access to education. Within this meaning, the Narodnost (nationality) meant that Russian folk had to stay away from education (Western influence) in order to preserve the folk's pure Russian national character. Orthodoxy — Orthodox Christianity and protection of Russian Orthodox Church. Autocracy — unconditional loyalty to House of Romanov in return for paternalist protection for all social estates. Nationality — Narodnost has been also translated as nationality, national spirit, or populism. Before its adoption by Nicholas I, narodnost was a central tenet of Russian Romantic writers, the Russian expression of a principle more often called Romantic nationalism. The word represents exact translation of term Volkstum and describes the same ideas. Narodnost means recognition of the state-founding role on the Russian nationality and equal citizen rights for all other peoples inhabiting Russia, with exclusion of Jews because of their "imminent hate towards Russian people and anti-human nature". The sequence of three parts of the triad remained fixed in all circumstances even when the words themselves changed: military cadets were instructed to be "Christians, loyal subjects and Russians", the common public motto called "For Faith, Tsar and Fatherland". The triad was inherently unbalanced in favor of centralized autocracy. The Russian Orthodox Church was impoverished and incapable of being an independent political force. The Government remained wary of any philosophy, including theology. Nationality through empowerment of the people was not a choice from the start and became even less probable after the dreaded nationalist Revolutions of 1848 "reduced Nicholas to a state of almost catatonic fear". It also ran against the ever-increasing role of Baltic Germans in the government system; even converted to Orthodoxy, they retained their distinct ethnicity. The press, censored by the state, eagerly embraced the new doctrine and was dominated by it until the end of Nicholas's reign. Stepan Shevyryov, editor of Moskvityanin magazine, asserted that "even if we did pick certain unavoidable blemishes from the West, we have on the other hand preserved in ourselves, in their purity, three fundamental feelings which contain the seed and guarantee of our future development." Slavophiles, in particular, accepted the anti-European, anti-absolutist, paternalistic side of the doctrine. Mikhail Pogodin explained the paternalistic, peaceful nature of autocracy as seen by Slavophiles: "the secret of Russian history, the secret which not a single Western sage is able to comprehend: Russian history always depicts Russia as a single family in which the ruler is the father and the subjects are children. The father retains full authority over children while he allows them to have full freedom ... there can be no suspicion, no treason; their fate, their happiness, their peace they share in common. This is true in relation to the state as a whole..."
Nikolai Nadezhdin, who initially entertained the westernized, Schellingian notion of nationality, radically changed his mind in favor of Official Nationality in the wake of the Chaadayev affair (1837), writing that "nationality had always consisted of love of the Tsar and obedience, and which in the future should display in itself, to Europe's dismay, a brilliant lesson of how from the holy unity of autocracy, must arise an exemplary and splendid national enlightenment...". Nikolai Gogol in his final work Selected Passages from Correspondence with his Friends (1847) extended Official Nationality to relationships between landlords and serfs: "Make them [serfs] see clearly that in everything that concerns them you are acting in accordance with the will of God and not in accordance with some European or other fancies on your own." ^ Hutchings, Stephen C. (2004). Russian Literary Culture in the Camera Age: The Word as Image. Routledge. p. 86. ISBN 041530668X. ^ Thompson, Ewa M. (1991). The Search for Self-definition in Russian Literature. John Benjamins Publishing Company. p. 98. Hoffmann, David Lloyd; Kotsonis, Yanni (2000). Russian modernity: politics, knowledge, practices. Palgrave Macmillan. ISBN 978-0-312-22599-5. Hosking, Geoffrey (1998). Russia: people and empire, 1552-1917. Harvard University Press. ISBN 978-0-674-78119-1. Riasanovsky, Nicholas V. (2005). Russian identities: a historical survey. Oxford University Press US. ISBN 978-0-19-515650-8. Alexander III was the Emperor of Russia, King of Poland, and Grand Duke of Finland from 13 March [O.S. 1 March] 1881 until his death on 1 November [O.S. 20 October] 1894. He was highly conservative and reversed some of the liberal reforms of his father, Alexander II. During Alexander's reign Russia fought no major wars, and he was therefore styled "The Peacemaker". Count Sergey Semionovich Uvarov was a Russian classical scholar best remembered as an influential imperial statesman under Nicholas I of Russia. The Black Hundred, also known as the black-hundredists, was an ultra-nationalist movement in Russia in the early 20th century. It was a staunch supporter of the House of Romanov and opposed any retreat from the autocracy of the reigning monarch. The Black Hundreds were also noted for extremism and incitement to pogroms, nationalistic Russocentric doctrines, different xenophobic beliefs, including anti-Ukrainian sentiment and anti-semitism. Nikolay Ivanovich Gretsch was a leading Russian grammarian of the 19th century. Although he was primarily interested in philology, it is as a journalist that he is primarily remembered. Prince Platon Alexandrovich Shirinsky-Shikhmatov was Nicholas I's deputy education minister (1842–50) and education minister (1850–53) who spearheaded the Orthodoxy, Autocracy, and Nationality policy introduced by his predecessor Sergey Uvarov. He was also an amateur poet and translator.